Christmas is just around the corner, so I'll be focusing on various festive dishes for the next week or two. We'll definitely have some traditional roast pork with sauerkraut and black pudding for a couple of times. But we've got a big family and many festive meals ahead, so there's plenty of room to play. For the last few years we've also roasted a goose, and my favourite side dish to a goose is stewed red cabbage. Here's the way I've been making it couple of times now - and I love it. The prunes add a sweetness, orange juice some freshness and a good balsamico a lovely tang. And it's a light and virtually fat-free side dish - a great alternative to the usual rich Christmas fare. Heat oil on a large saucepan. Add onion and fry for a few minutes, until onion starts to soften. Add the cabbage and sauté for 5-7 minutes, stirring regularly. Add the prunes, orange juice, balsamic vinegar. Season with salt. Cover with a lid and simmer on a low heat for about an hour or so, stirring every now and then, until the cabbage has softened, but still retains some bite. (Check the liquid level at the end, and add some water, if it looks too dry). NB! You can prepare this a day or two in advance. Gently re-heat thoroughly before serving. This recipe was also included in my second cookbook, Jõulud kodus ("Christmas at Home"), published in Estonian in November 2011. This looks and sounds delicious! But I'm a bit puzzled about the amount of prunes. Do you mean 250 grams? Thank you for posting this! I have a love-hate relationship with red cabbage. I want to love it, but it is always a little bit offputting. This sounds like it might have the right mixture of sweet and acid to balance the flavor, so I'm looking forward to trying it soon! I love red cabbage and have always made it with apples. I've never thought of using prunes. Thanks for the yummy suggestion! 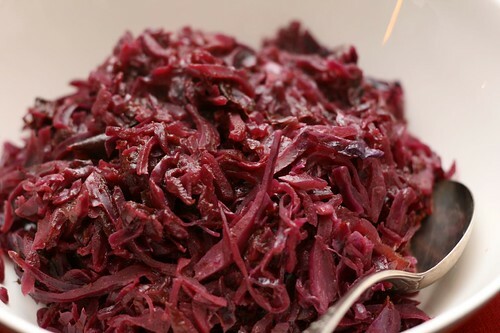 Love love red cabbage. It is always a stable on my Christmas dinner table.